"Claudia: Wife of Pontius Pilate," a novel written by Diana Wallis Taylor, tells the story of a Biblical character who is not well-known, but plays an important role. Claudia grew up in a guarded villa as a child and has been sheltered her whole live. Suddenly at the age of sixteen Claudia finds herself being given to Pontius Pilate to be his wife. In the midst of turmoil and controversy Claudia finds who she is and whom her heart really loves. The author does a wonderful job of bringing this time period alive, complete with the setting, customs and culture as well as historical events. I find Claudia to be a fascinating and admirable character. I really enjoyed reading about her and the relationship between her and Pontius Pilate as they grew to love each other. As with everyone, Pontius Pilate has more than one side and personality, a softer side of him that comes out with Claudia. This is a great book that will draw you into the lives of Claudia and Pontius Pilate. 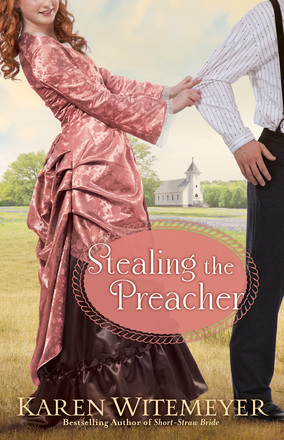 Karen Witemeyer's latest historical romance novel, "Stealing the Preacher," is a fun read that takes the readers back to spending time with the Archer brothers. Crockett has always filled the role of being the spiritual leader at the family ranch, but now he has the chance to be a pastor at a church. However, on the way to speaking at the church, he is kidnapped and taken to a ranch. Upon arrival, Crockett finds out that he was kidnapped in order to be given to the outlaw's daughter for her birthday as she has been praying for a preacher to lead their church. Feeling an immediate spiritual connection with Joanna and feeling a need to return to her church and ranch after his position falls through, Crockett begins to work for the outlaw who originally kidnapped him. Silas has been hiding from his past for over the past decade and he has also been hardening his heart from God. As Crockett becomes immersed in the ranch, the church, the community and also in Joanna's heart, he realizes that being kidnapped really was part of God's plan. I loved "Short-Straw Bride" and I was so excited to read another book about the Archer family. These books are so well-written and fun to read. Crockett is an admirable man and leader on the both the ranch and as a preacher. Joanna is a great heroine as she is so loyal to her father and is strong during trials and pressure. The minor characters all added so much to the story as well. Jackson played an important role throughout the book and I loved his character. I am hoping there will be more books about the Archer family, but maybe one written about Jackson as well. A Five-Star Read!!! Enter Today - 6/20 - 7/9! The latest book in the Land of Shining Waters series. This is Tracie Peterson's second book is her Land of Shining Water series and I am looking forward to many more in this series. The author does such a wonderful job with bringing the time period and culture alive in her stories and this one is no exception! Emmalyne and Tavin are both excellent strong main characters and have many conflicts to deal with as they are trying to balance being loyal to their families yet follow their hearts as well. The tension and union struggles with the quarry and the role that depression plays in many lives is not glossed over at all which adds to the realistic feel of the story and is eye-opening. Filled with traditions, tragedy and true love, this story is one that will be read and enjoyed by historical fiction fans. This is a story that will have the readers believing in true love that will remain strong over the years, during separation and through many trials. To read other reviews included on this blog tour click here! Leanne Hadley has put together a collection of inspirational stories in her book "Touching Heaven: real stories of children, life, and eternity." God loves each of us and children are close to God's heart and can be used to reach adults and bring us closer to God. There are several accounts shared in this book about children whom the author has had contact with, each story tells the child's story. The book concludes with lessons learned from the children. This book is an inspiring collection of stories that will leave you appreciating life, feeling closer to God and thinking about eternity and life in general. I would recommend this book as a gift for anyone who has recently dealt with the loss of a loved one or for someone involved with children's ministry. "Slow Moon Rising," by Eva Marie Everson, is the latest Cedar Key novel and ties all three books in the series together. The four Claybourne sisters' stories are told as well as their step-mother's story and their father and mother's as well. Anise, Kimberly, Jamie-Leigh, Ami and Heather have all struggled with things in their lives and have all relied on each other and their faith in order to get through the tough times. Cedar Key has been home to this family during the summer and holidays and has brought pain and healing to these women as the girls are faced with memories of their mother, yet also find a sense of peace while being at the home. This is a well-written book and the story had me crying, smiling and immersed in the characters' lives. I love how this book was written as it changed perspectives throughout the story, yet each woman's story was still connected. I have read the other two books in this series and this book just really filled in all of the missing pieces of those two books as well as filling in some gaps and bringing everything to a nice conclusion for this family in the end. This is a really touching story and will leave you wishing for a home in Cedar Key to escape to in times of need for rest, relaxation and healing. 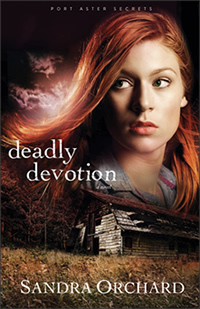 "Deadly Devotion," book 1 in Sandra Orchard's Port Aster Secrets series, is an excellent start to the series as it drew me into the storyline and the characters' lives and has me waiting for book 2 to be released! Kate's mentor is dead. The police have concluded that it was a suicide, Kate believes that Daisy was murdered. Kate marches into the police station intent on convincing them to reopen the case; however she is met with resistance and decides to take the matter into her own hands. However, Kate is happy to have some help from detective Tom Parker, but Kate begins to question if she can actually trust him. As Kate delves more and more into the case, she uncovers secrets, secrets that people want left as secrets and motives for wanting Daisy to be gone and now possibly herself gone. Will Kate go too far to uncover the truth? This is an exciting read filled with many twists and turns throughout the story as various people are suspected (for good reason!). At first I felt as if the story was jumping around quite a bit, but after a few chapters I was really drawn into the story and my attention was held that I just wanted to keep reading to see what would happen as I found out along with Kate that people are not whom they appear to be. For more on this book, visit the author's website for some "bonus features:"
Melody Carlson's latest young adult novel, "A Simple Song," is a fun read and one filled with characters that can be related to. Katrina has a beautiful singing voice; however her parents believe it to be vain. After Katrina's grandmother passes away, Katrina is given some objects that belonged to her and Katrina discovers that her grandmother was a singer. Katrina's father needs surgery and in order to get the money to pay for this, Katrina with the help of her best friend applies to be on a reality television show. As Katrina enters the competition she must deal with being Amish in the English world (including traveling to California! ), worrying about what her community is going to say and if she will be accepted back in and deciding just how far she will go in order to fit in and possibly win the competition. This is a great story filled with valuable lessons for all young girls; although Katrina is Amish, she is an easy character to be able to relate to. I really enjoyed this book and I was really intrigued by the storyline of this book and while reading it I was not disappointed at all. Katrina is faced with choices and while she does "test" a little by dressing differently, she ultimately sticks to her values and beliefs and stands up for herself in a world that is so different from her own and what she is used to. If you enjoyed Carlson's "Double Take," you do not want to miss out on this one! 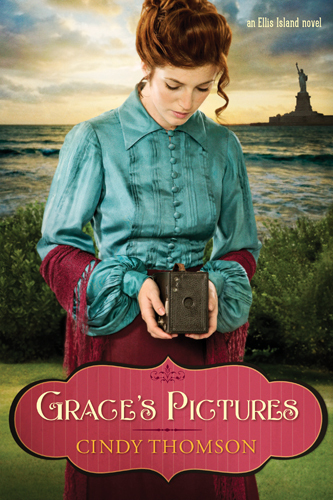 "Grace's Pictures" is an Ellis Island Novel written by Cindy Thomson and it is a book that will inspire you and transport you to the bustling streets of New York City in the early 1900's. Grace is trying to find a way to earn money in order to bring her mother to America from Ireland. However, things do not go as planned and Grace is not sure whom to trust and put her faith in. Grace's camera may be a tool that could help and yet also harm her as Grace has a run-in with a gang. This book is an exciting and also touching read that immediately drew me into the story and also in Grace's life and world. The cover is beautiful on this book and sparked my interest before even reading what the book was about. The author writes in such a style that holds the reader's attention, and the writing is filled with vivid imagery and historical details. I am looking forward to reading more in these series! To read an Q&A with the author go here! To read an excerpt from Chapter 1 of this book click here! "Ray of Light" is the second book in Shelley Shepard Gray's The Days of Redemption Series and I really enjoyed book 1, I enjoyed this one even more! This is not "just another Amish novel," this is a story of secrets, love and moving on after heartbreak that will tug at your heartstrings and have you rooting for the characters to find love and happiness. I was immediately drawn into the story and wanted to keep on reading as I was so engrossed in the characters' lives. Right away I loved Amanda and Regina and loved reading about their interactions with Roman and their interactions with each other. I highly recommend this book (really any book by this author! ); it is a quick and engaging read! *Thanks to Litfuse Publicity Group for the complimentary copy of this book and for a spot on the blog tour! "Ripples Along the Shore" is book 3 in Mona Hodgson's Quilted Heart Novella series. Caroline has returned to her hometown after losing her husband during the war. Caroline is stuck with living with her sister and brother-in-law, and knows that she needs to make changes in her life. Caroline wants to leave on a wagon train and feels like this is the change that she needs to make in her life; however of course this is met with opposition by mainly one man, Garrett. Will Garrett and this move be ultimately what Caroline needs in her life? This is a quick read and this is a must-read for Mona Hodgson fans. However, I highly suggest that this book and the other books in the series be read in order. Being that they are novellas they are short and the characters carry over in each books, so in order to get the full story about each of the characters, you must read all of the novellas. I love the role of the quilt club and the therapeutic aspect of quilting in the books. This is a series that will transport you back in town and make you long for simpler times and a close-knit quilting group of your own. 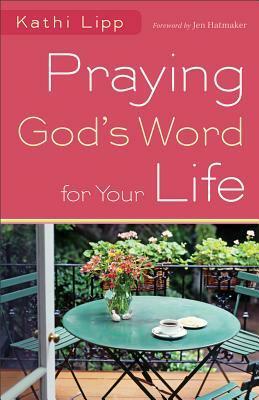 Kathi Lipp's latest book, "Praying God's Word for Your Life," is written in a conversational tone and it will seem as if you're sitting down with a good friend for a chat over coffee. The book begins with a few chapters on prayer and preparing to pray for yourself as this is not an easy or typical thing, as we tend to prayer for others instead of ourselves. Following this are chapters that focus on different areas and times of our lives, such as when we feel overwhelmed, financial situations, our role as a mother, and health issues to name a few. Each chapter includes specific prayers, verses and scenarios. This is a great book, filling with stories, verses and prayers that will inspire and help in times of struggles and throughout every day life. This book is divided into specific sections making it an easy "go to" resource. The author's style of writing makes the book easy to get into and I know it will be one that I go back to time after time again. To watch the book trailer go here! "A Heartbeat Away," written by S. Dionne Moore, is a Quilts of Love story and it is a beautiful, sweet love story set during the Civil War. Joe and Beth are both strong main characters and ones I fell in love with throughout the story. Gerta is a character I admired as well and loved her role in the story and in their lives. Joe and Beth are each fighting for their beliefs and are on opposite sides, yet they cannot help that their hearts are drawn to each other. I actually felt like I was transported back in time during this story and immersed in the characters' lives. This is the first book that I have read in this series, and I loved how the quilt was such a part of the story. I will be reading more in this series for sure! Irene Hannon's latest novel is not her typical suspenseful read; however it will still appeal to Hannon fans and is one that you will not want to miss out on! "That Certain Summer" is inspiring, filled with love, healing and looking to the future. Karen and Val are sisters and have never been close and feel like they have nothing in common and have always been played against each other by their mother. However, when their mother needs their help and Val returns home for the summer, these two sisters find out that they may have more in common than they thought and can really be friends as well as sisters. Not only do Karen and Val reconnect, but they are also dealing with issues in their own lives. Karen's husband has left her and their daughter for a younger woman. Karen is used to being the one who will go along with the flow, but now it is her time to take control of her own life. Val has had to live with a secret and guilt for so many years and now she is trying to move past this. However, when a handsome man and his motherless daughter become a part of her life, can Val really forgive herself and move on? This story is an inspiring and emotional read that will immediately draw the reader into the characters' lives and the story line. Val and Karen are both so easy to relate to and I found myself wanting to join them on their Saturday coffee and grocery shopping time, a time to talk, share recipes and support each other. This is a great read to begin the summer and will inspire you to have "that certain summer" - a summer to grow as an individual, forgive and forget, look to the future and love.